Rosemary plants kept indoors over winter require exacting temperature, moisture and sunlight levels. Rosemary is a popular aromatic herb that symbolizes friendship, loyalty and remembrance. Often sold during the holiday season in a decorated topiary form, the value of rosemary goes beyond its ornamental use. Since the Roman era, a variety of fresh and dried Rosemarinus officinalus products have been used for culinary, medicinal and cosmetics purposes. Rosemary oil has both antiseptic and astringent properties, and is used in making scented soaps and lotions. Fresh rosemary leaves add flavor to many foods, and the plant’s unique pine scent imparts festive spirit inside a home. Rosemary is not hardy to Wisconsin. It is generally cultivated as a potted plant during the growing season, with clay pots working best. The plant requires moist yet well-drained soil media like potting mix with added perlite. In summer, potted rosemary can placed in a sunny garden spot, buried in the ground up to its rim. The plant should be watered as needed to keep the soil moist, and water-soluble fertilizer should be applied every few weeks. Before the first frost arrives in autumn, the potted rosemary can be removed from the ground and brought indoors for overwintering. However, maintaining a rosemary plant indoors can be a little tricky. During the winter, warm and dry air inside homes can wither its leaves and desiccate the twigs. Rosemary needs cool and moist conditions in wintertime, as well as a good amount of sunlight (or artificial light that doesn't emit heat). Moreover, the plant's health can be iffy if it is over- or underwatered. Rosemary plants that are received as gifts during the holiday season need specific care to ensure their survival. Any foil wrap should be removed to prevent any waterlogging, and the container should be set in a drip tray. 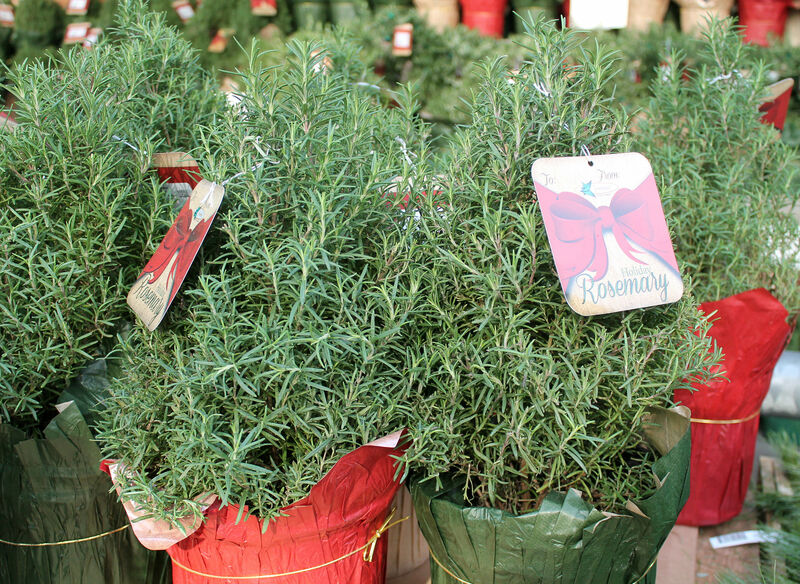 Rosemary plants are often sold in topiary form during the holiday season. The plant should be placed near a cool, bright spot where the temperature doesn't exceed 65° F. A window facing towards the south and/or west may work well, but the plant should not be near any radiator or other heat source. Alternatively, the plant can be stationed inside a garage as long as the temperature doesn’t drop below freezing and it is exposed to a sufficient amount of sunlight. In winter, heated homes can dry out container soil quickly. Therefore, the moisture of a rosemary plant's soil should be checked once or twice a week by assessing how it feels to the touch at about one inch deep. If the soil seems to be dry, the plant should be watered thoroughly. Once per week, the plant should be misted with a spray bottle, or a humidifier can be used to boost humidity inside the house. Additionally, rosemary should not be fertilized during the winter. Once spring returns, after the threat of frost has passed, the rosemary plant can be moved outside and is ready for repotting with fresh media, completing the seasonal cycle.